For the Jaundies 23 Take a handfull of Chery Leaves Seeth them in a pint of milk and lett them boyle well then straine it and drink a good draught thereof all night and in y morning. For the the headache Stampe bittony and Lay it on thy head under thy Cappe or bind it to thy head. 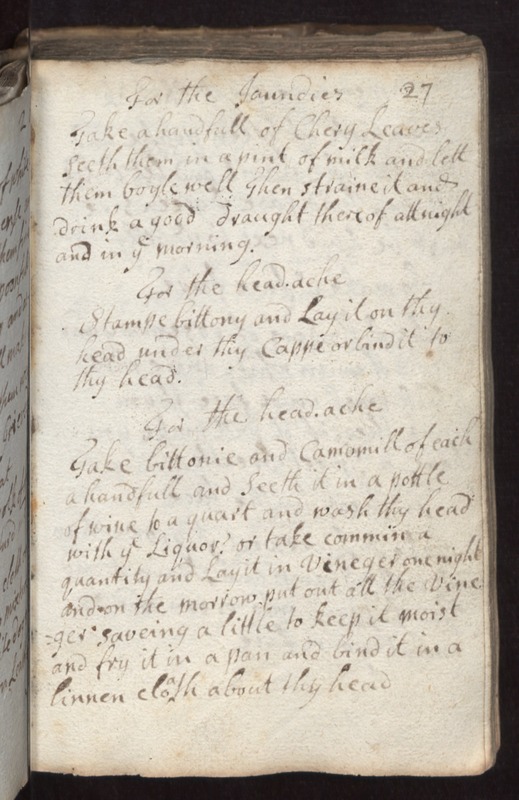 For the headache Take bittonie and Camomill of each a handfull and Seeth it in a pottle of wine [to? lo?] a quart and wash thy head with y Liquor? or take ["commin a"? OR commodius?] quantity and Lay it in Vineger of one night and on the morrow put out all the Vine -ger saveing a little to keep it moist and fry it in a pan and bind it in a linnen cloth about thy head.